Garys bike’s going to have 35mm seat-tube. That’s pretty big. Most steel frames have 28.6 or 31.8 seat-tubes but this is going to be much bigger. There are a few other steel bikes out there that use seat-tubes this big, possibly the most well known is the WTB Phoenix. Gary has a lovely Phoenix already and it’s pretty clear that this frame is inspired to some extent by that frame. The seat tube for this frame is actually a down-tube. We’ll take a Columbus down-tube and cut off one butted end. This’ll give us a 35mm tube, butted at the bottom-bracket area to a wall thickness of 0.7mm. 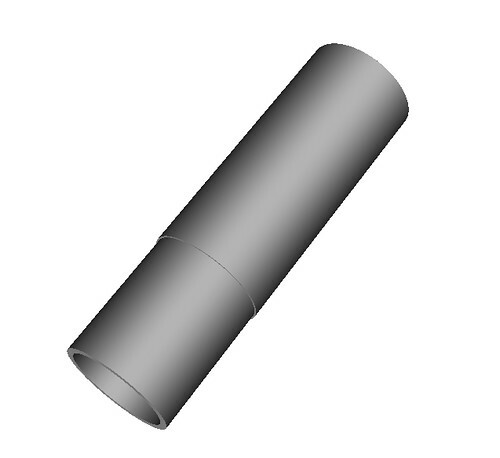 The rest of the tube will have a wall thickness of 0.5mm. Doing this gives us a couple of problems. The first is that tubing with walls this thin is more likely to deform under heat and given that we’ll be joining the top-tube and the two seat-stays to this part, it’ll get pretty hot. The other problem we’d get leaving it like this is that we’d struggle to get a seat-post to fit. It’d need to be a 34mm post and that would limit our options. To get round these problems, we’ll make a sleeve to slide inside the seat-tube and we’ll braze this in place. This’ll give us a much thicker wall to work with which will prevent deformation when doing the rest of the torch work and will bring the inside diameter down to 31.6mm. A much more sensible size for sourcing seat-posts. The sleeve will either just be a constant diameter shim that will slide in and be brazed or it might have a step on it. Still not decided yet.